From lazily swimming next to the Zambezi River in the luxurious pool, to perching by the al fresco bar, Sausage Tree Camp offers an indulgent experience in between exciting safari activities. Nestled in Lower Zambezi National Park, we find this is a perfect spot to watch hippo grazing by the river. The camp has recently been renovated, and now boasts seven beautiful Luxury Tents built with canvas and eco man-made ‘wood’ to create that coveted rustic vibe. All of the tents have been constructed close by to the river’s edge, offering unbeatable views of the adjacent reed islands that are abundant in magnificent wildlife. Each feature a comfy lounge area, and an expansive decking area fit with an outdoor lounge and private plunge pool. Meanwhile, the Kigelia House is ideal for small families with its two bedrooms, open plan living room, and expansive decking with a pool. The main veranda is a comforting spot to sip on a morning coffee and watch wildlife drink by the riverbank, whilst each of the tents are dispersed enough for elephants to leisurely wander past. If you fancy a break from enjoying the views, Sausage Tree Camp offers a variety of fantastic activities, including canoeing, river cruises, and even walking safaris. Serenity is this rustic camp’s forte, and with beautiful river views and authentic, homely décor, we have never felt so relaxed. 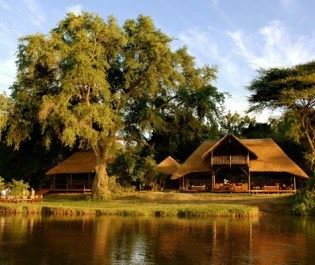 Perched along the Zambezi River, this luxury tented camp just oozes tranquility, charm, and comfort. With gorgeous, airy tents, beautiful viewing decks, and a lovely slow pace of lifestyle, we love Anabezi's calming atmosphere. Becoming one with nature is one of Africa's greatest pleasures, and where better to do so than Kafue's tranquil plains and slow winding rivers. Those searching for tranquility and serenity will certainly feel Livingstone's charm, yet still being close by to some of Zambia's colourful parks. South Luangwa is full of unforgettable experiences. It's not just game drives here, but exciting night drives and walking safaris, too.